T.S. Eliot’s Prufrock may have measured out his life in coffee spoons, but for me – like so many others – it would be more accurate to say that my life has been measured out in Grand Nationals. My earliest memory is of sitting on my grandmother’s knee for the radio broadcast in 1958 (and disgracing myself thoroughly when affrighted by the shriek which ensued when her investment on Surprise Packet went west at Becher’s, second time round). Equally vivid is the magic of watching that first BBC televised race in 1960, on the family’s fuzzy, black-and-white postage-stamp of a TV (bought specially for the occasion). Since then the string of memorable years and winners – Foinavon, Specify (my first in the flesh at Aintree), Red Rum, Aldaniti, Corbiere, the huge Party Politics, tiny Minnehoma, Amberleigh House – have defined the fabric of my life, in a way almost too deep for words. My emotional involvement in this one race has been huge, and like so many others I’ve watched what has been allowed to happen to the race over the last decade with increasing anger, disbelief and despair. Having failed to rock the Grand National by direct on-course action, the animal activist groups (aided by the two-faced tribunes of the RSPCA) have cleverly manipulated social media to promote cheap, easy and highly effective onslaughts on the race. These sour demagogues have gone a long way towards spoiling the Grand National for everyone: officials, connections, commentators and onlookers alike have been reduced to quivering mounds of jelly, hoping and praying that we can just get the wretched thing over without any of the “farcical” incidents or “tragic” deaths which have “besmirched” the spectacle – or so we’re lectured. The last two years have proved particularly torrid. I don’t propose to get into the arguments for or against the many changes made on “health and safety” grounds, except to say that it’s quite possible that such well-meaning initiatives as raising the standard of the entry, compressing the weights, lowering the fences and narrow-funnelling them may have done little to reduce the number of equine deaths, yet have quite possibly resulted in a faster and more relentless pace, increased congestion mid-field and more rather than less danger to horse and rider. The road to hell is paved with good intentions. I’d rather stress one, important positive. A notable pendant to this year’s predictably bad press has been that many pundits within the sport (on Twitter as well as TV) are standing up to be counted. They are talking honestly about the questionable merit of further changes: the race has been made as safe as it can be, without defacing it as the National Treasure it is in the hearts and minds of the huge majority of the one-bet-a-year general public. As with the Great Whip Debate, the Great Grand National Debate has focused attention on the bad faith of our “friends” at the RSPCA, intent on quick wins at Racing’s expense to suit their own, dark and dirty PR agenda; on the really tiny number of activists intent on ruining it; and on the high quality and massive expertise of the BHA’s equine welfare resources surrounding not just this particular race, but racing generally. Paul Bittar‘s BHA statement today is admirable. It is clear (though politic) about the need to monitor and evaluate the changes already made, rather than reacting once again like headless chickens to the lamentable fact of two, high-profile equine deaths. In other words, Bittar is suggesting for those with ears to hear that it is time to draw a line in the sand, as firmly as BHA hope to do with the latest round of changes to the notorious, new Whip rules. Meanwhile, both David Muir‘s mixed messages (exposed in a fine on-the-hoof interview by Nick Luck after racing on RUK yesterday) and his organisation’s factionalism (made clear in a far less friendly press release from the RSPCA’s CEO Gavin Grant this morning) become ever more dangerously apparent. Where Muir talked of “ongoing modifications”, and “remaining concerns”, apparently suggesting an eternal round of tinkering with drop fences, cheeseparing away at the height of the fences and reducing the number of runners, his bellicose boss stated outright that “It’s clearly not safe enough. Excitement and drama at Aintree yes, death and suffering no, has to be the message.” How you can have one without the other is a question Grant avoids: instead he asks for the removal of Becher’s Brook (“perhaps it’s time for that to go”) and for the ground to be made even softer. What evidence does he present? None whatsoever. He relies on the patrician faith of the self-righteous. The RSPCA seems to be offering us a choice of death by a thousand cuts, or a swift emasculation. Whichever you believe, the ultimate aim is clear: until the National is a flat race run over a mile – and perhaps not even then – the likes of Grant will never be satisfied. 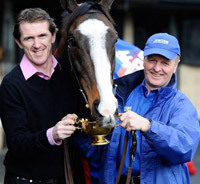 His faction of the RSPCA wants to do away with the fences, with the race, and with National Hunt racing in its entirety. As the Whip fiasco has already demonstrated, all these years of negotiated appeasement with the tweedy, warm and affable Muir (a self-styled “equine consultant” with no veterinary qualifications whatsoever exerting personal pressure on a sport which boasts huge professional expertise in the area of animal welfare) have been an enormous waste of BHA’s corporate time and energy. It is time the RSPCA, that wolf in Muir’s sheep’s clothing, was shown the door politely yet firmly. We need to take stock. There must be no more modifications to the race until we have worthwhile statistical data on whether the “improvements” already made are for better or (quite possibly) for worse. The Sport’s insiders – including some senior journalists who show more interest in courting easy demotic appeal than speaking honestly and responsibly – need to steel themselves to ignore this annual media ritual which would have the public believe that Aintree is no better than a sacrificial, equine bloodbath. We need to trust the general public, to educate them and treat them less like protected children to be fed on a diet of Disney World. We need to have the courage to ignore the puritan fringe, animal terrorists and rabble-rousers who are intent on soiling the pleasure of the race for its many millions of fans around the world. Last – not least – we need to celebrate the positives. We need to applaud yesterday’s thrilling and dramatic race. 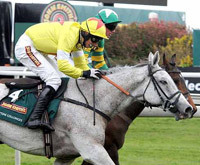 We need to praise a magnificent winning grey (the first since 1961) in Neptune Collonges. Just as surely, we should celebrate as well as sorrow for the victims: the deaths of Synchronised and According to Pete are not “tragedies” of which anyone in Racing need be ashamed. 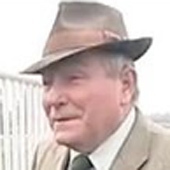 Racing fans are not sadists who relish sudden death, watching this one race ghoulishly with what one mistaken member of the Twitterati described yesterday as “morbid fascination”. No. Once again, these deaths are not “tragedies”. They are sad accidents, the inevitable downside to what is – and needs to be if it’s to be worth running at all – the ultimate test of Jump racing, a uniquely powerful experience for participants and beholders alike; an iconic treasure which does much to explain why we British come closer to worshipping the horse for its beauty, courage and fearlessness than any other nation on the planet. That, I feel, rather than the prevalent sentimental slush, is the spirit in which we should remember the 2012 Grand National. We owe it to the victims, even more than the victors.